With no further adieu, SASC and the Uninhibited Crew are starting off the new year off right with a crazy sweet lineup at PAVED Arts in Saskatoon on January 12th….and I’m going to VJ at it! 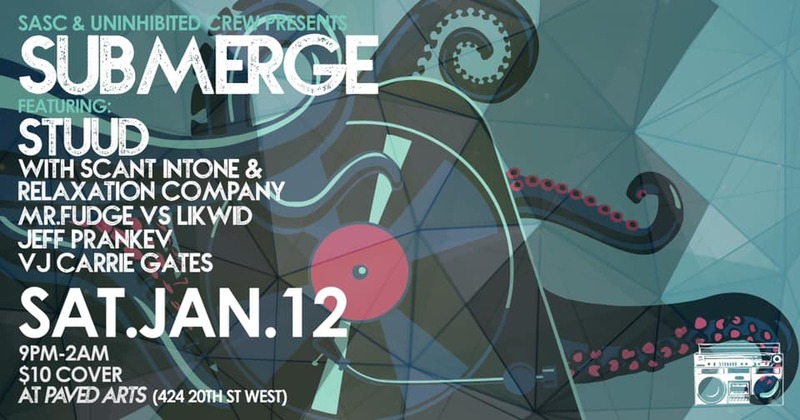 On Saturday January 12th, SASC & Uninhibited Crew take over PAVED Arts for an eclectic showcase we’ve dubbed SUBMERGE. …and projections by the one and only VJ Carrie Gates. Bringing a date? Stay late. Thank you to Elise Pallagi for this sweet video of me performing with Scant Intone and The Relaxation Company! I am loving this pic that Constantine Katsiris took of my visuals while Jeff Prankev (aka DJ Dislexik) was laying down the law with some killer crazy good techno!